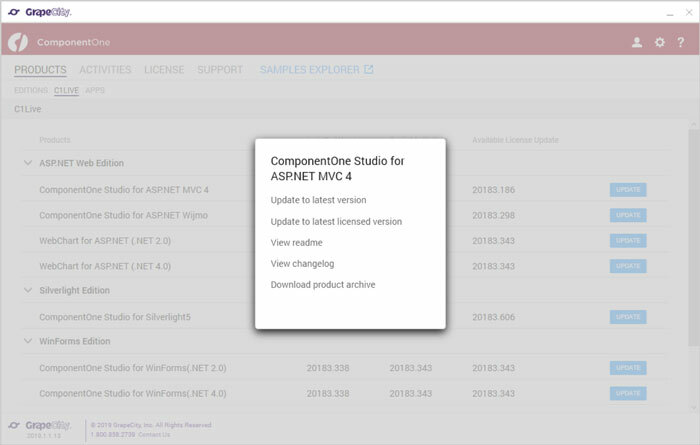 With the ComponentOne Studio Enterprise new 2019 v1 release, we are introducing the ComponentOne Control Panel— a new tool to improve your interaction with ComponentOne libraries. 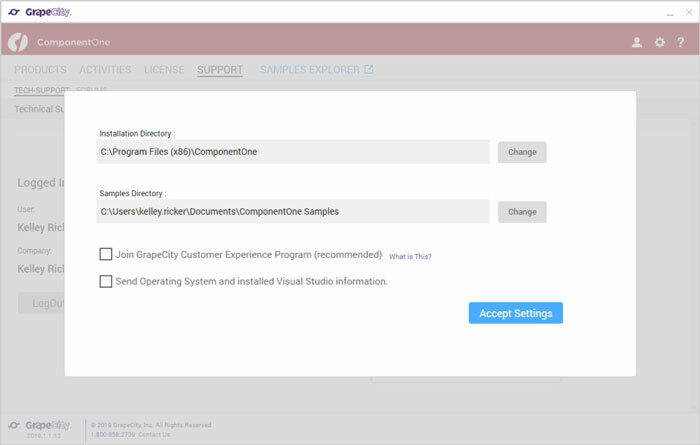 The new application handles installing, versioning, updating, and licensing the controls on your machine, and it provides fast access to samples and support. The Control Panel streamlines the process of using ComponentOne controls and replaces several disparate apps from the past. The Control Panel replaces the traditional ComponentOne web installer, and it makes it much easier to simply pick a platform and install a suite of controls that support it. In this article, we’ll take a look at all of the major features supported in the new ComponentOne Control Panel. The Editions Tab in the Control Panel tells you the current version of the libraries that are installed on the machine (including whether it’s the latest). It lets you install the controls for a given platform, product samples, and allows you to navigate to the product page on the website if you want more information. You can also click the Change/Repair version button to choose between installing different versions of the controls (in case you need to support an older version). It makes it much easier to install libraries a la carte to fit your needs. C1Live was previously a stand-alone application, but it’s much more convenient to have the feature built into the Control Panel. It allows you to both stay up to date or find an older version of a library that you need. 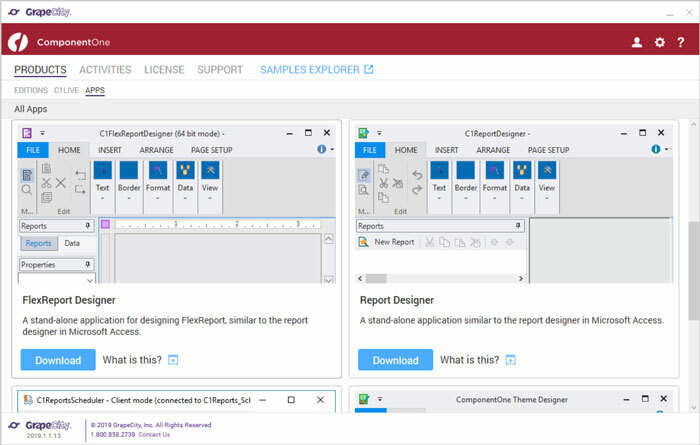 The Apps panel provides access to full fledged ComponentOne applications that we ship to our customers, such as the FlexReport Designer app or the Theme Designer application. Another new feature in the Control panel is the new Activities pane. Activities allow you to track what changes you’ve made through the Control Panel, and it should make it easier to troubleshoot if an update causes a breaking issue for you. Whether you're installing a new set of controls for a different platform, updating something you’ve already installed, or trying to roll back to an old version, you should have a clear record of your changes. 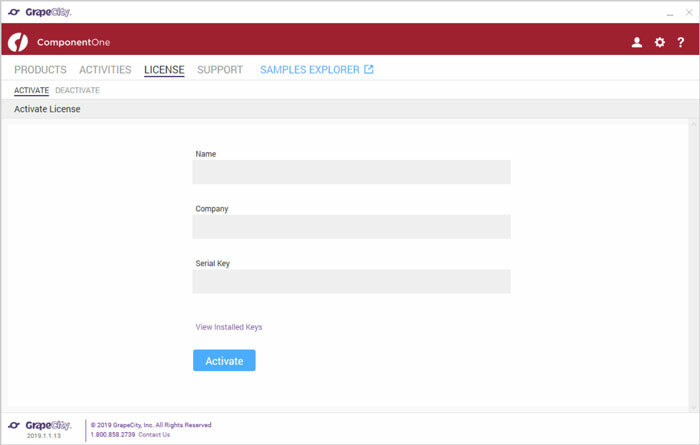 The License pane gives you the same functionality of the old C1LicenseActivation utility (which was a separate application). It can be used to activate or deactivate licenses on a machine (in case you want to move the license to a different machine). 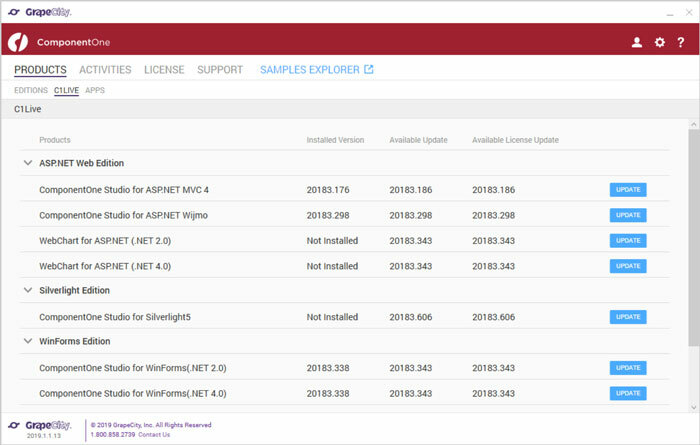 You can also view any licenses that have already been installed. 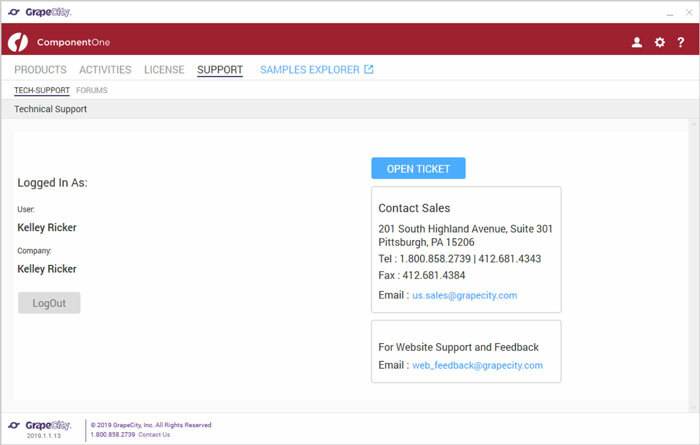 The Support panel allows you to raise technical issues in our online ticketing system or navigate to the forums to submit an issue. If you want to submit a ticket through the Control Panel, you’ll need to be logged into your account (or create one if you don’t have an account). There’s also information for contacting our sales and website support teams if you run into any problems. 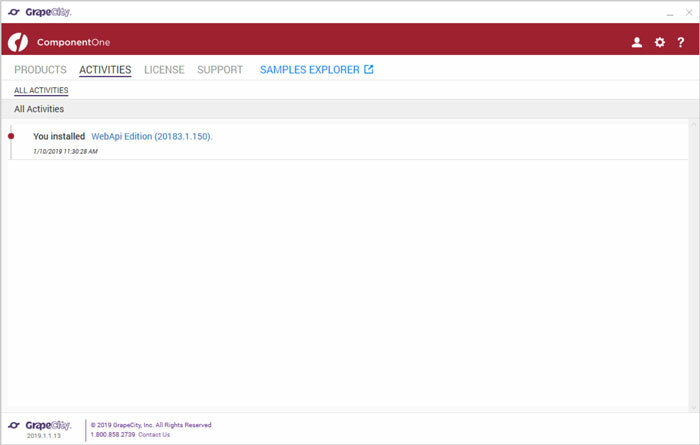 The final tab is actually a link that opens up the Samples Explorer application which gives you numerous ComponentOne samples illustrating the many different controls we provide with numerous use cases. The samples range from instructional to simulated real-world applications and are sorted by platform. 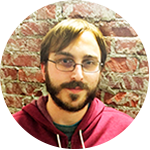 It’s a fast mechanism for identifying controls, features, and uses that can enrich your own applications. 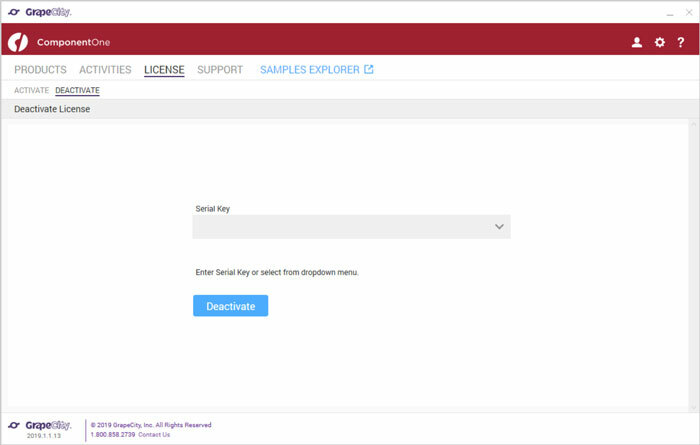 On a final note, the Control Panel also allows you to adjust some of your settings, such as install location, samples directory, and the customer experience program (which helps the ComponentOne team enhance product quality, add features to popular samples and controls, and address problems). 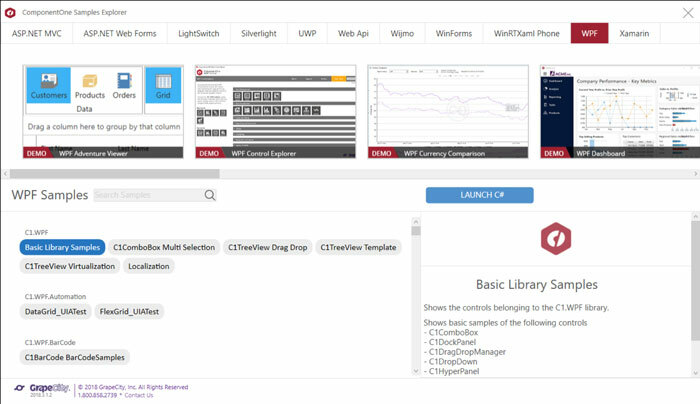 The Control Panel will greatly improve the average developer’s experience using ComponentOne controls. We’re excited to receive feedback on this. Please feel free to send any comments, enhancements requests, or issues that you may encounter as we’re focused on working to improve customer experience and make our controls easier to use.